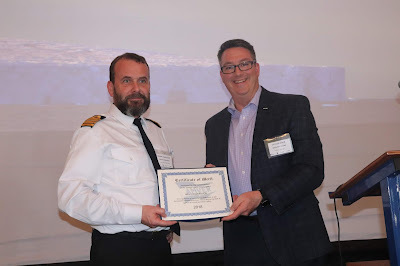 Amver Director Benjamin Strong presented the Icelandic research vessel Arni Fridriksson with it's 2018 Amver Award to Captain Audunn Kristinsson, Deputy Chief of Operations for the Icelandic Coast Guard, on Tuesday, April 9, 2019 in Reykjavik, Iceland. Mr. Strong was participating in the Association of Arctic Expedition Cruise Operators annual search and rescue workshop and table top exercise. The workshop brings search and rescue professionals, cruise industry personnel and academia together to discuss the latest trends in Arctic search and rescue. In addition to the rescue discussions, a table top exercise scenario is facilitated in small groups and shared with the participants. "This is the perfect venue to recognize Arctic search and rescue," said Amver Director Benjamin Strong. "As the participants learned about recent cruise incidents and discussed search and rescue technologies it was the perfect opportunity to recognize the Arni Fridriksson. I am grateful to AECO for giving us an opportunity to recognize Iceland's contribution to safety at sea." The Arni Fridriksson, an Icelandic research vessel, earned it's second Amver participation award in 2018. The variety of ships enrolled in Amver never ceases to surprise us. This week 18 additional ship joined the Amver safety network. From an asphalt carrier to a mega yacht, you've agreed to ensure no call for help goes unanswered. Thank you for continuing to support Amver. Help us welcome the latest members. Thank you! You've responded to our appeal to continue to support Amver and enroll new ships. Today we share the ten latest ships enrolled in the Amver system. From LNG tankers to open hatch cargo ships. We are always curious about the types of ships and the names of the ships. Tell your friend and keep joining Amver! Now help us welcome the latest members of the Amver safety network. If you've been wondering where the list of new ships in Amver has been look no further. For some reason, fewer and fewer ships are joining Amver. We encourage all ships, on a voyage of 24 hours or greater, to enroll in the system. It's easy, free and could result in your crew saving a life. Help us welcome the latest members of the Amver safety network. 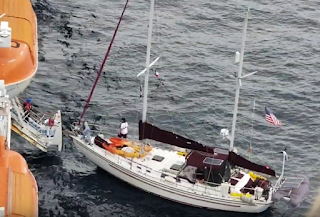 The Amver participating cruise ship Regal Princess rescued two survivors from an aircraft that ditched in the water 20 miles southeast of Grand Turks, Turks and Caicos on Tuesday, March 5, 2019. U.S. Coast Guard rescue authorities in Miami received notification from air traffic control personnel that the aircraft had ditched. Rescue personnel immediately diverted a Coast Guard rescue aircraft, the Coast Guard Cutter Legare and queried the Amver system. The Regal Princess was located closest to the distress location. The captain of the 1,000-foot ship agreed to divert and arrived on the scene quickly, launching a small boat to recover the two survivors who were in a life raft. With favorable winds and waves of only four feet, the rescue boat from the Regal Princess was able to quickly recover the survivors. The survivors were reported to be uninjured and stayed aboard the Bermuda flagged cruise ship until it arrived in Saint Thomas, U.S. Virgin Islands. The Regal Princess, managed by Princess Cruise Lines, enrolled in Amver on May 27, 2014 and has earned five Amver participation awards.